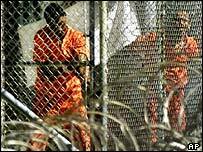 The US has appointed Navy Secretary Gordon England to head a review to see if any of the 600 detainees at Guantanamo Bay, Cuba, can be released. Mr England said prisoners would be freed if they do not pose a threat to the US and that in some cases there would be a quick solution. The process is due to begin in the next couple of weeks. So far, only three detainees at Guantanamo Bay have been charged and several dozen have been sent back home. The reviews, which will be conducted in secret by a panel consisting of three military officers, will give prisoners the chance to provide facts to support their case for release. "The question is: Are they still threats to America? " Mr England said. "It's not guilt or innocence." Most of the detainees were captured in Afghanistan in late 2001 during the US-led invasion to oust the Taleban regime. There has been much criticism of the legal limbo the detainees have found themselves in. Not included in the review are the prisoners that US President George W Bush has said will face a military tribunal. "It is essentially a parole board"